Jena Ashby, Program Director, thanked all those in attendance who have decided that living in complacent, uninspired life is not for them! “This time of year we want to especially recognize those who regularly make Habitat for Humanity a part of their life. We are so grateful for their service to our organization” Ashby said. 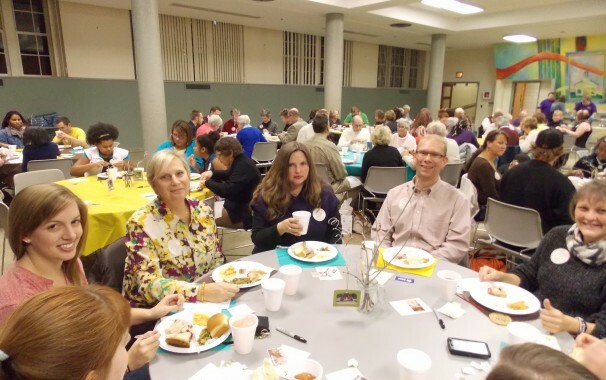 Tuesday, November 19th, at First Presbyterian Church nearly 130 Habitat volunteers, homeowners, and supporters gathered to recognize individuals who volunteer with the organization. Special recognition awards were given out for all types of volunteers, including CARDS crew members (weekly volunteers), office volunteers, ReStore volunteers, and Partner Family mentors. Three very special awards were also given out, each carrying a name-sake of a founding Habitat volunteer. Stan Keil was presented the Cecil Thomas Volunteer of the Year Award. Ron Hoopingarner was awarded the Bob Haupt ReStore Volunteer of the Year Award. 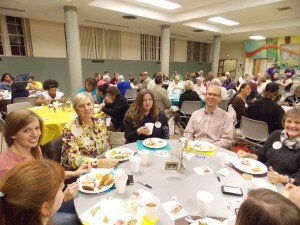 Beth Parris was honored with the Richard Artes Distinguished Service Award. Muncie Habitat for Humanity was formed in 1986 to serve families in Delaware County with housing and homeownership opportunities. Muncie Habitat – in partnership with 1,000’s of volunteers and donors – has served over 110 families with housing during its first 27 years. Muncie Habitat for Humanity provides housing solutions through construction of new homes with sustainable building practices, rehabilitation of vacant and foreclosed homes, and through repair of existing homes (A Brush with Kindness program). Muncie Habitat for Humanity is an affiliate of Habitat for Humanity International – a global organization in over 70 countries committed to a vision of ‘a world where everyone has a decent place to live’. Habitat for Humanity International has served more than 800,000 families (representing 4 million people) worldwide with housing solutions since the organization was founded in 1976.